This year's death toll from drug-related violence in the north Mexican city of Ciudad Juarez has reached 3,000 - 10 times the figure recorded in 2007. 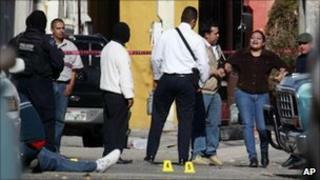 The grim milestone was reached after two murders on Tuesday, the Chihuahua state attorney-general's office said. Last year, 2,763 people were killed in Ciudad Juarez, 1,140 more than in 2008. More than 30,000 people have died across Mexico since President Felipe Calderon launched an offensive against the drug cartels in 2006. Northern states have seen much of the violence, with cartels fighting each other for control of the lucrative drug smuggling routes to the US. Arturo Sandoval, a spokesman for Chihuahua's attorney-general, announced on Tuesday that, with two weeks left in 2010, 3,000 murders had been recorded in Ciudad Juarez, a city of 1.3 million people. The latest deaths were the result of two separate incidents, he said. One of the victims was a 35-year-old man found shot dead in a car, while the other murder saw a 46-year-old killed in front of his family. A total of 7,386 people had been killed in Ciudad Juarez in the past three years, he added. In 2007, about 300 people were murdered there. Most of the victims were members of rival drug gangs, but civilians and members of the security forces were frequently targeted or caught in the crossfire, officials said. In one incident in October, at least 14 people were killed when masked gunmen stormed a garden party and then shot indiscriminately at dozens of youths. Thousands of people have fled the city in the wake of the violence. Ciudad Juarez is situated just across the border from El Paso, Texas, a city with one of the lowest murder rates in the Unites States. On Monday, hundreds of doctors and health workers in Ciudad Juarez went on a 24-hour strike in protest at the high number of threats and attacks they are subjected to. This year, three medical workers have been killed and 11 kidnapped.